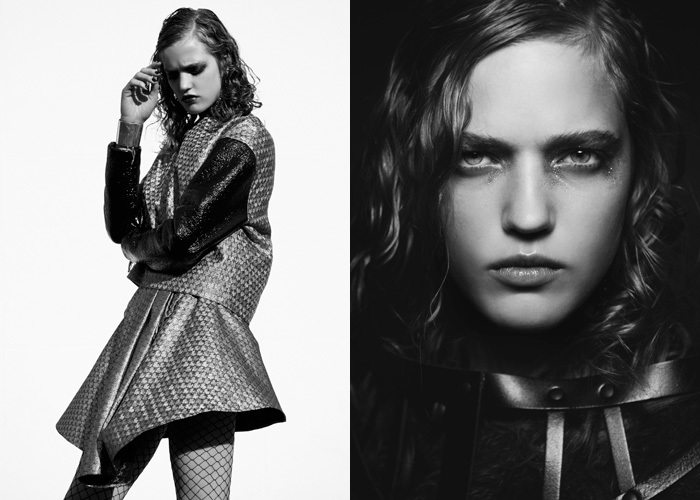 Photography by Gilad Sasporta and fashion by Sophie Clauzel. Click for details. Knitted and embroidered jacket by Tsumori Chisato, black & white shirt by Alexandre Vauthier, black short with suspenders by Chromat at miseencage.com, black creepers by Amelie Pichard and black tights Stylist’s own. Gold lurex top by Kenzo, bracelet and earrings by Jean Paul Gaultier. Blue jacket and skirt by Kenzo, patchwork jean top by Naco Paris, gold lurex tights stylist ‘s own and necklace by Jean Paul Gaultier. Gold lurex top and skirt by Kenzo, bracelet and earrings by Jean Paul Gaultier. Green knitted sweater by Tsumori Chisato and black leather harness by Bordelle at miseencage.com. Black jacket, belt, bracelet and necklace by Jean Paul Gaultier. Black leather jacket by Plein Sud, and pink ”Ultimate révolution” shirt by Vivienne Westwood. Green knitted sweater by Tsumori Chisato, black leather harness by Bordelle at miseencage.com, red leather embroidered pants by Tsumori Chisato and lack hight heels with red studs by Christian Louboutin. Photography by Gilad Sasporta and fashion by Sophie Clauzel. 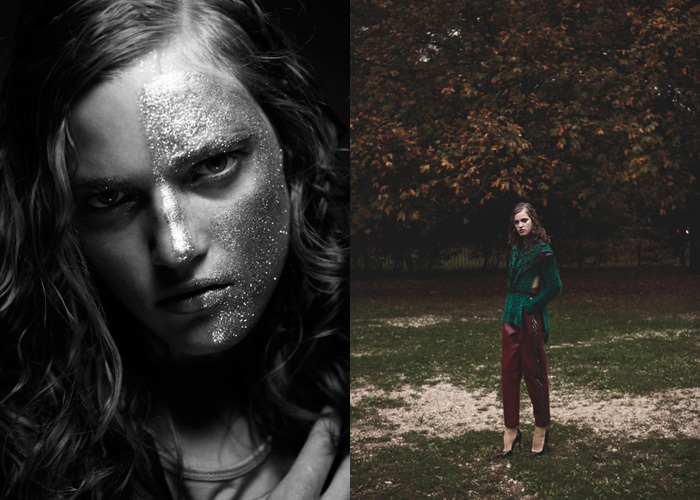 Hair by Olivier Henry, make up by Olivier Baïlle and modeling by Milana Kruz@Women.